I had the joy of attending the Penguin Random House Christmas Party last December and I picked up a selection of exciting new titles at the event, including Anna and the Swallow Man, which was pitched as The Boy in the Striped Pajamas meets The Book Thief. The former is one of my all-time favourite books but I didn't read more than a few chapters of the latter (blasphemy, I know!) so I was intrigued by this comparison and keen to discover in which camp it would fall for me. With an atmospheric and melancholy backdrop to what was at times a surprisingly wondrous and whimsical story, Anna's journey pulled me in from the very first page. This is an astonishing novel and one that no doubt will become a classic. It's 1939 and seven-year-old Anna lives with her father, a linguistics professor at the university, in Poland. He enriches Anna's education with his own and despite her young age, Anna speaks many foreign languages, including Russian, German, English and French. Rather than learning it from books, Anna learns the languages by speaking to the people in her city and so she associates each of the foreign words and accents she picks up with those in her live, rather than an entire country or group of people. One day Anna is left with Herr Doktor Fuchsmann from the local pharmacy as her father has to go away for a few hours. Nothing new there, however when he doesn't return to pick her up, Anna is forced to spend the night under the pharmacy counter and the next day she's unceremoniously kicked out. Sitting on the street outside the pharmacy, Anna meets the Swallow Man. The man speaks many languages which Anna does, but also an entirely new one: bird. Having come to the realisation that her father will not return, Anna's curiosity leads her to follows the Swallow Man, which is the start of a brand-new adventure, one in which they walk from one place to the next, meeting few people on their travels bar the occasional soldier and an unexpected, reluctant friend. I sometimes feel I overuse the word 'quirky' in my reviews, but I do think that is a very apt way of describing the character of Anna and the fascinating journey she undertakes throughout this novel. She has an incredibly rich upbringing for a girl in the 1930s, which makes her a unique protagonist in any novel and especially one set in Poland on the cusp of the second world war. The to-the-point narrative style of writing added to this feeling of peculiarity, creating an atmospheric story with an incredible sense of time and place. While I didn't connect with the ambiguous ending, the majority of this melancholic read completely pulled me in. Seeing the world unfold through Anna's intelligent little eyes made for a fascinating perspective on the devastation that was invading her country and reading about her sheer wonder at small discoveries, even amid the horrors and confusion of a war happening all around her, was surprisingly beautiful. I admit I read very few new books set amid the second world war. I should probably pick up more of them as the ones I have read in recent years have been incredible; heart-wrenching and beautiful at the same time. But due to growing up in the Netherlands and history lessons for my entire school career being 99% focused on the second world war, it's one of those types of books I associate with what I was forced to read opposed to what I choose to read, even though in hindsight I do appreciate the stories enriched my education and attributed to the way I see the world now. While I have in recent years been moved by novels such as Letters to the Lost by Iona Grey and The Dandelion Years by Erica James, in children's literature in particular there is a huge gap in the catalogue of wartime books I have read. Anna and the Swallow Man showed me how incredibly humbling and eye-opening it can be to experience the second world war through the eyes of a child. One of the books I read in school was Oorlogwinter (Winter in Wartime) by Jan Terlouw and after reading Anna and the Swallow Man I want to give it another chance, as I feel I will be more touched by it than I was a few decades ago. And a book that inspires me to pick up another – especially one I didn't appreciate fully the first time around – is a keeper. 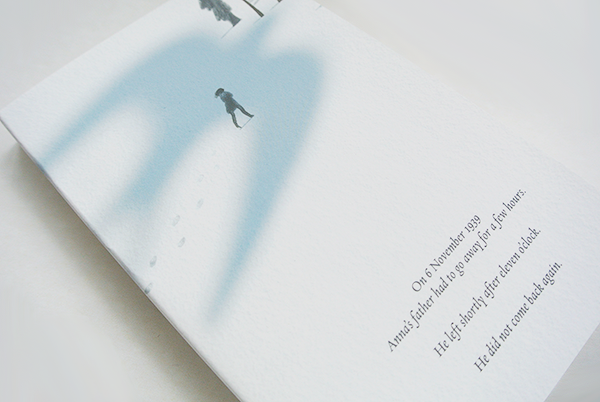 Anna and the Swallow Man will be published on 26 January 2016 by Random House Kids and you can pre-order the novel from Foyles or your own preferred retailer.